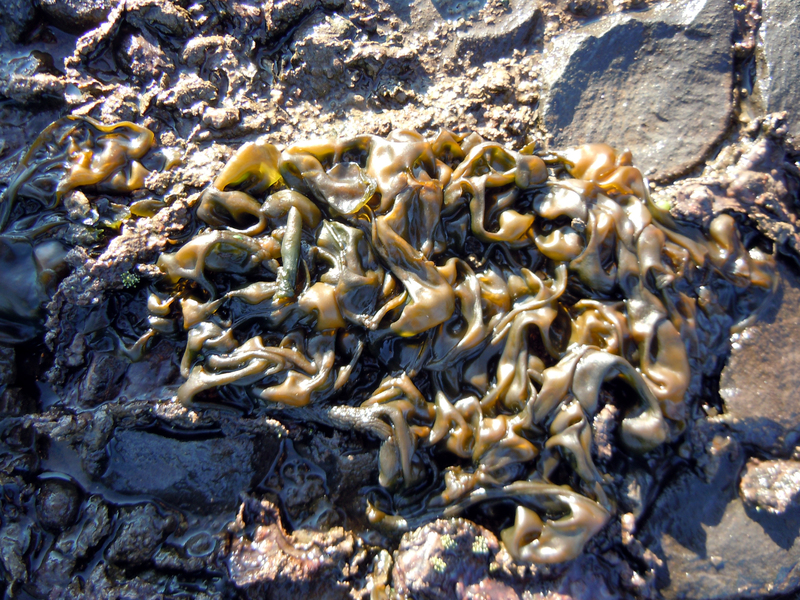 Nostoc colonies are composed of chains of bacteria that grow on the surface of soil, gravel, and even cement. These bacterial growths can be a slip hazard. These bacteria form conspicuous green to greenish-brown globby, squishy mats that may carpet alleyways and can yards in container nurseries. This article is adapted from one that appeared previously in The Digger 58:25-29 (2014). If you have wondered this, chances are you are referring to Nostoc, a cyanobacterium. While sometimes called a blue-green alga, this organism is technically a bacterium that derives its energy from photosynthesis. It can also fix nitrogen. 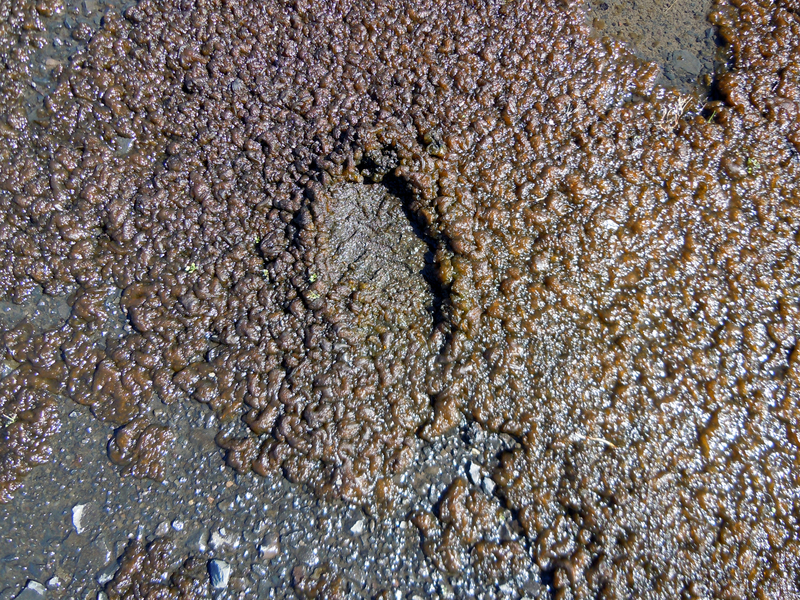 Nostoc colonies are composed of chains of bacteria that grow on the surface of soil, gravel, and even cement. When dry, Nostoc is barely noticeable, forming dark, flaky, paper-like sheets. When wet, it swells up and forms conspicuous green to greenish-brown globby, squishy mats that may carpet alleyways and can yards in container nurseries, especially if the ground is compacted and poorly drained. The colonies are covered by a jelly-like sheath that contributes to the colony’s ability to tolerate extended periods of drought and freezing temperatures. 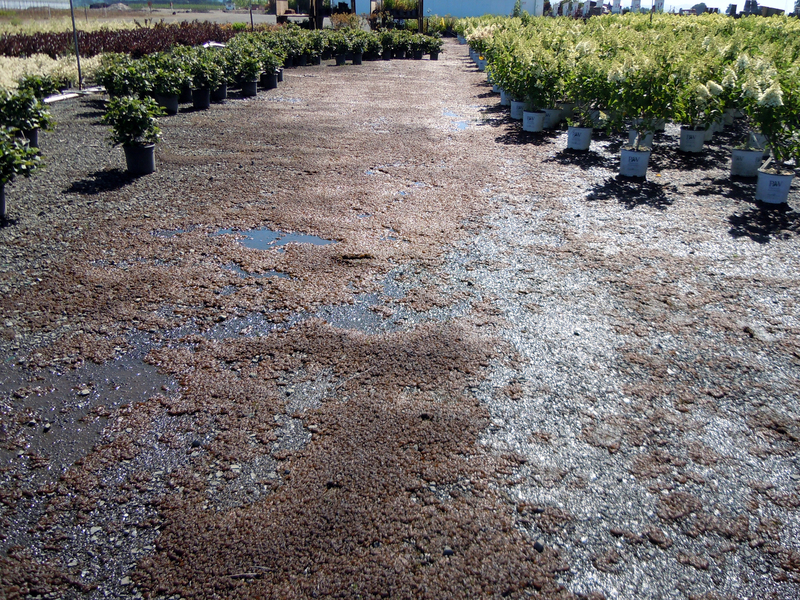 These characteristics have also made Nostoc challenging to control in a nursery setting, where it has become widespread on soil, gravel, and ground cloth, especially for nurseries that grow plants in containers. The sudden appearance of Nostoc after rainfall led people in ancient times to believe that it fell from the sky, hence the common names “star jelly,” “star slime,” or “heaven vegetable.” So, where did it come from? Nostoc is distributed around the world in habitats that are poorly drained, particularly where phosphorus and other nutrients are abundant. But Nostoc is not just a biological curiosity. It impacts nursery production in two ways. Worker safety is the primary issue, as Nostoc is slippery while wet and often grows on hard surfaces and walkways where workers can easily lose footing and sustain injury. Another issue with this organism is its ability to grow on the bottom of containers, creating an unsightly product for customers. There are tools available that growers can use to mitigate this problem. If Nostoc-colonized areas are free of plants during key time periods, solarization or use of propane burners can work well. In situations where chemical control is warranted, pelargonic acid (Scythe) can provide longer-term control. Improving soil drainage, as well as reducing irrigation and nutrient inputs, are likely to have the best long-term results for controlling Nostoc, but this is not always practical. Some nurseries have had success with using heat to kill Nostoc, using hand-held flame-throwers or tractor-mounted propane heaters. Repeated treatment may be necessary to prevent re-establishment of Nostoc colonies. Soil solarization can also be effective. Cover the affected area with 6-mil clear plastic, preferably a horticultural plastic that is treated on the underside with an anti-condensation coating. The anti-condensation coating results in greater clarity of the plastic, and more effective solar heating. Seal the solarization perimeter with “sand worms” (tube sand), boards, or a band of gravel to weigh down the edges of the plastic and prevent heat from leaking. Two to four weeks of solarization during the hottest period of the summer is generally effective. Solarization does not work well if the area continues to be irrigated, as water pooling on the plastic surface limits solar heating. A few chemicals are labeled for treatment of algae, moss, or liverworts in container nurseries. One of these, pelargonic acid (Scythe, DowAgroSciences) was especially effective for treatment of Nostoc in OSU field trials. During periods of active growth in early summer, pelargonic acid killed Nostoc and prevented its regrowth under irrigated conditions for several weeks. Care should be taken to avoid spray drift onto desired plants, as pelargonic acid is a broad-spectrum (non-selective) herbicide. Products that were moderately effective were copper sulfate and sodium carbonate peroxyhydrate (TerraCyte PRO, Biosafe Systems), however regular copper sulfate is not labeled for application to soil or gravel, and may pose a hazard to fish and aquatic invertebrates exposed to contaminated runoff.